items. This works great for both our laptops, ipads, ipods, etc. We made one area where everyone charges so there are no more lost cords, which cuts down on how much money is going out of our home, and insures our children are not going to bed with their tech. My husband would actually like to see this with few extra plug in spots to be perfect for him, but until one comes along this fits our family quite well. This Charger can be found on Amazon. 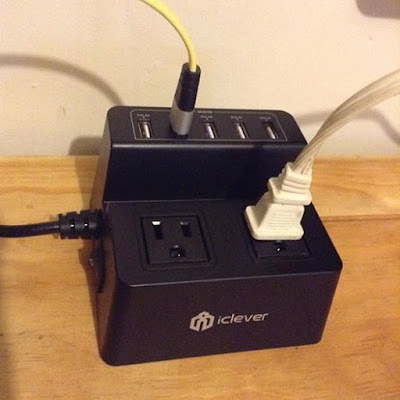 What iclever has to say about their product. With 2 AC outlets and 5 USB charging ports in just one unit, this power station eliminates the need/dependence on multiple chargers to charge your devices. - Premium quality circuitry and fire-retardant material ensure life-time safety and reliability. In compact size with 5ft power cable, it is portable to anywhere for convenient charging and easily reaches out-of-sight wall outlet. Disclosure: MarksvilleandMe received one or more of the products mentioned above as part of a promotion with Tomoson and iclever. Regardless, MarksvilleandMe only recommends products or services we use personally and believe will be good for our readers. Some of the links in the article may be “affiliate links.” This means if you click on the link and purchase the item, I will receive compensation. If you would like MarksvilleandMe to review a product or service please contact us at marksvilleandme@gmail.com.